Genetic diversity in 20 accessions of kinnow collected (five each) from four orchards viz., Central Institute of Arid Horticulture (CIAH), Bikaner, Agricultural Research Station, (ARS) Bikaner, ARS, Sriganaganagar and Regional Research Station (RRS), Abhohar were evaluated through RAPD analysis. Each of the 11 primers tested generated amplicons and out of a total of 69 amplicons produced 66 were polymorphic, with an average polymorphism of 95.60%. Two primers (OPG 4 and 11) produced a maximum 10 amplicons each that were all polymorphic. The Jaccard’s similarity coefficient recorded an average similarity of 0.51, ranging from 40% (CIAH, Bikaner) to 52% (ARS, Sriganganagar). In the SAHN clustering based on UPGMA algorithms out of the 20 accessions, 17 accessions grouped in two major clusters, two accessions (C and F) together with a high level diversity (almost 50%) into a third cluster while accession H remained outlier. The poor clustering of accessions from the same location indicated diverse genotypes which could have come from diverse basic material or chance seedlings or accumulation of mutations. The presence of diversity in the orchards could hamper realization of potential yield and uniformity of produce. The study thus clearly suggests need for purification and multiplication of desired types from the presently growing kinnow plantation. 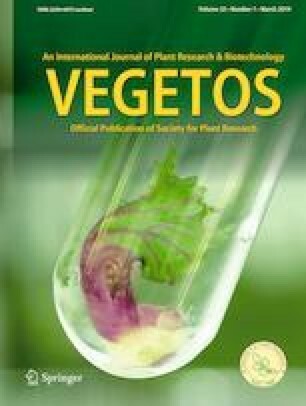 The authors are thankful to Director, CIAH, Bikaner for providing leaf samples for molecular analysis.